I have a question on 538 (the Sanctus in Swedish). It seems to be in G natural minor, but it's not really that simple. The melody moves like this: 3-1-2-7. A minor third followed by a major third. Then it moves up to the C note (4). G minor doesn't really make sense. At first it looked like it was in F major. I assume this is a monophonic song, right? If there are no other parts, then the fact that the sixth scale degree never appears means there’s no easy way to distinguish between G Aeolian or G Dorian. (I would use the term Aeolian rather than natural minor in this context, but it amounts to the same thing). Technically, the single-flat signature and a fairly clear emphasis on G as tonic would indicate G Dorian, but the lack of an E flat in the signature is, again, not very significant since the note never occurs in the actual melody. 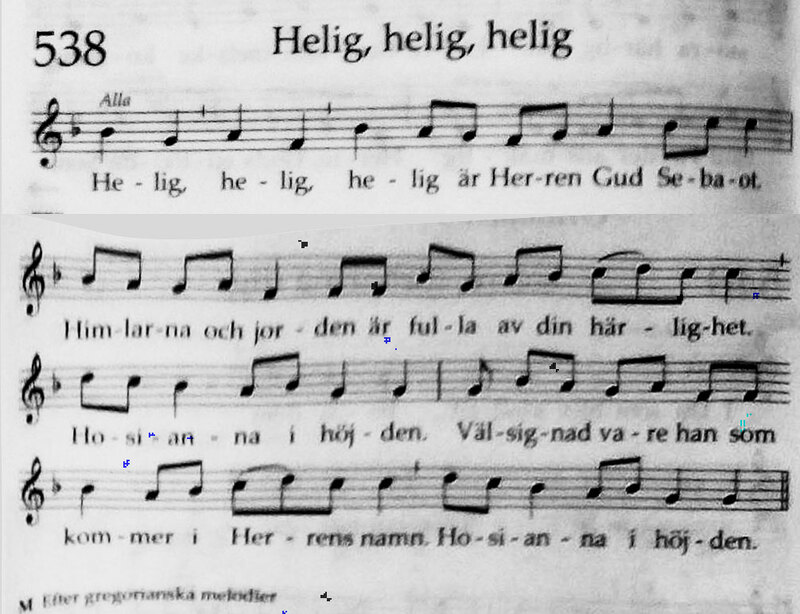 Judging from the lack of meter and unusual beaming patterns, I would guess that this melody was originally Gregorian chant or some similar tradition, and thus from the Medieval or early Renaissance eras. If that’s true, then it’s worth noting that mode wasn’t nearly as clear-cut of a concept then as now. First, there were the plagal, or “hypo-,” versions of all the authentic modes. Second, determination of mode varied from Renaissance theorist to Renaissance theorist. One theorist might make a determination based on ambitus and final, while another would be compelled to give a different designation due to the tenor (primary chanting tone) of the melody. Depending on why you’re trying to decide on a modal designation, you might need to study those details or see if a Mediævilist comes along to answer. Difficult to read in parts, but it comes over to me as G Dorian. The key sig. of one flat puts the parent key as F major. The last 6 notes strongly suggest a 'home note' of G. Before that, it goes on a journey! We could detect several centres. And that's what modal music does! It isn't obsessed with the dominants and tonics of Common Practice harmony. Ambiguity is its stock-in-trade. Not the answer you're looking for? Browse other questions tagged theory key or ask your own question. What is the process I should follow to analyse a piece like this?